As newcomers to the Valley, we have been looking around for a place which is close to our workplace, serves delicious food, and is also gentle on our wallets. The Village Cafe in Pulchok ticks all three boxes. Started by Sabah Nepal SAARC Business Association of Home Based Workers), the cafe employs around 30 women who would otherwise be completely dependent on their husbands, fathers, or sons for their livelihoods. The women use their indigenous culinary knowledge to whip up tasty Newari dishes seven days a week. The dining area is located in the open, with large umbrellas to provide shade. 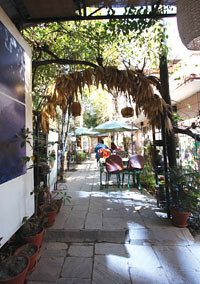 The plants and flowers placed beside the tables give the impression that you’re eating in a garden, a welcome respite from the noise and dust of the city. Next to the restaurant is a shop run by Sabah Nepal, selling handicrafts, clothes, and accessories and offers an interesting diversion while you wait for your order to arrive. If you are unfamiliar with Newari cuisine like us, we suggest you ask the waitresses for recommendations. The women are more than happy to explain each unfamiliar item on the menu and always serve with a smile. The menu is a little confusing, made up of four separate laminated pages instead of one booklet. However, there are useful descriptions in English printed beside each dish. For starters we ordered a plain bara (Rs 50) and mushroom bara (Rs 90) from a number of other toppings like egg and vegetables. The plain bara was excellent, fluffy, crisp, and very tasty. The mushroom bara, while bigger and laced with shredded black mushrooms, was a little soggy and not as good as its plain Jane cousin. The cheese pakoda is by far the best thing on the menu. For just Rs 90, you get five deep fried cheese balls, crunchy, and full of flavour. It was so good we ordered a second round and were tempted to add another plate. For variety we tried both the egg and the peanut butter chatamari. The egg chatamari (Rs 60) was a little spicier than expected, while the peanut butter chatamari (Rs 90) seemed better suited for a dessert than a main course since it was so saccharine. Although we ordered a ‘large’ portion of chicken chhwela (Rs 150), it came in a small bowl barely enough for one. Fortunately the chicken itself was delicious, lightly fried, and marinated in a spicy red sauce. We ended our lunch on a sugar-high with two yamari dumplings. The chaku yamari (Rs 35), stuffed with sweet dark molasses and sesame seeds, contrasted strongly with the khuwa yamari (Rs 35), with its lighter filling of raisins, cashews, and condensed dry milk. While both make for excellent desserts, the contrast between them is remarkable and speaks to the diversity of Newari dishes. With its home-made quality food and affordable prices, we will probably make The Village Cafe our regular lunch and dinner joint. However, its small portions may not satisfy someone who has skipped breakfast and would like a very filling meal. Then again, you could always order second and third helpings. And as foreigners, we probably need some time getting used to Nepali portions. Best of all, we left with a content tummy and happy heart knowing that our meal (in a small way) was helping disadvantaged women become bread earners for their families. 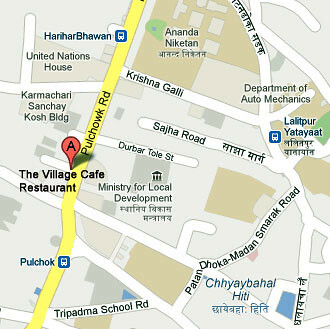 How to get there: From the Ashok Stupa alongside Pulchok Road, follow the road north past the NCell telecom building and look out for the Village Café’s sign on the left.